35 lucky Caltex customers walked away with a total of RM105,000 worth of goodies in Chevron Malaysia Limited’s recently concluded “Spend & Sweep” promotion. 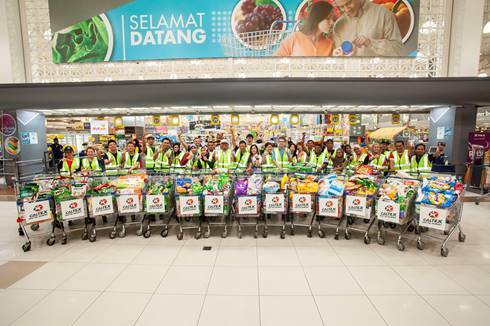 Partnering with local hypermarket chain MYDIN, the promotion drew participation from all walks of life, and required participants to “Sweep” as many items as possible in MYDIN using a shopping cart, in only 3 minutes. During the promotion, 3 “Spend & Sweep” challenge rounds were conducted in MYDIN Bukit Mertajam (Penang), MYDIN Gong Badak (Terengganu) and MYDIN USJ (Selangor) throughout the span of three months. By spending a minimum of RM30.00 in a single receipt at any MYDIN outlets or Caltex Stations, customers stood a chance to participate in the “Spend & Sweep” challenge.